Casual Canine™ Sporty Fleece Pullovers These cozy Sporty Fleece Pullovers will keep dogs warm and ready for any activity. Hooded garments feature a sweatshirt-style muff pocket on the back with an embroidered Casual Canine logo, a convenient leash hole, and stylish stripes on the sleeves. Ribbed knit cuffs and waist provide a comfortable fit. 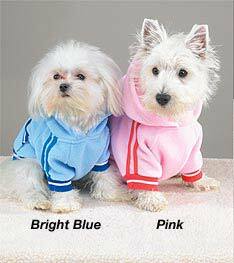 Made of machine washable polyester fleece for easy care. Over Half Off !! Only $6.00 X-Small fits up to 8"